SAO PAULO, Brazil, Oct. 23, 2017 – On Wednesday, Oct. 25, World Pasta Day, celebrity chefs Bruno Serato and David Hertz will announce the global pasta industry’s “The Power of Pasta” initiative. More than 3 million plates of pasta have been donated to various charities fighting hunger around the world thanks to the support of worldwide pasta producers. This is part of the International Pasta Organisation (IPO) global pasta industry’s celebration promoted by event Chair and IPO President Paolo Barilla. Chefs Serato and Hertz, along with several local chef ambassadors, will also recommend a recipe for serving the pasta such as spaghetti with tomato sauce, or “spaghetti al pomodoro,” that is simple, delicious, healthy, sustainable, and brings people together around the table. World Pasta Day offers us the opportunity to share how pasta of Italian tradition is increasingly appreciated and valued in many countries around the world that have developed excellent local recipes,” said Mr. Barilla. “From the pleasure of a tasty meal and good nutrition, to the awareness that it is accessible and respectful of the planet, these are all features that make it a modern product. The kick-off coincides with World Pasta Day festivities held here this year with a gathering of pasta makers, industry members, scientists, media and other opinion leaders from around the globe. Hosted at the Federation of Industries of the State of São Paulo (Fiesp) by ABIMAPI, the Brazilian trade association, World Pasta Day 2017 will unite pasta lovers the world over in their passion for pasta. Chaired by ABIMAPI Chairman Claudio Zanão and Paolo Barilla, the event will feature engaging speakers, including food expert and author Kantha Shelke, Oldways President Sara Baer-Sinnott, and physician/nutrition specialist Mauro Fisberg. Additionally, three Brazilian and one Turkish scientist will join as signatories of the Scientific Consensus Statement on the Healthy Pasta Meal. With Brazil and Turkey, scientists from 10 countries, also including France, Portugal, Mexico, Argentina, Italy, Brazil, Spain, Russia, Turkey, and the United States, have signed onto the consensus. Scientists around the world continue to support the role of the healthy pasta meal for all,” said Ms. Baer-Sinnott of Oldways, the nonprofit that organizes the Scientific Consensus Conferences on the Healthy Pasta Meal. “The signatures of these top international experts are an important addition to our ongoing effort to gain worldwide recognition of the important health and environmental benefits of pasta, and pasta’s role in cuisines around the world. Chefs Serato and Hertz will attend World Pasta Day 2017 to introduce the global charity initiative and talk about the importance of social responsibility. Serato, who worked his way up from busboy to owner of the acclaimed Anaheim White House restaurant in California, founded Caterina’s Club, a nonprofit organization inspired by his mother, Caterina, that serves 4,000 warm nutritional meals to underprivileged children every single night. For his humanitarian work, he has received many honors including being named a CNN Hero, and knighted by the Italian government. His new book, “The Power of Pasta: A Celebrity Chef’s Mission to Feed America’s Hungry Children,” featuring a blurb from Sophia Loren, was released this month. My mother taught me to care for others, and when I see the number of hungry children and adults out there, I know we have a lot of work to do,” said Chef Serato. “Through the Power of Pasta, offering a simple dish like spaghetti with tomato sauce using local seasonal ingredients, we can help feed the hungry, meeting different culinary traditions and bringing people together over a healthy meal. Hertz, a well-known chef and social entrepreneur in Brazil, has also been a devoted proponent of social transformation through food and gastronomy. As the founder of Gastromotiva, Hertz and his team tackle issues such as hunger, malnutrition, unemployment, and shortcomings of an unbalanced food system. Hertz is an Artemisia entrepreneur, an Ashoka fellow, and has received awards and recognition for his initiatives, including a nomination as “Young Global Leader” at the 2012 World Economic Forum. Food is a powerful agent for transformation and social inclusion,” said Chef Hertz. “The Power of Pasta initiative is another way to help bring wellbeing to people in need, which can help transform lives. World Pasta Day, celebrated since 1998, recognizes the important role pasta plays in helping to feed the world through a variety of affordable, healthy and tasty cuisines. In fact, global pasta sales currently are up 2.3 percent, according to Domenico Tremaroli, industry leader for Nielsen, the data information conglomerate. Tremaroli, who is presenting the findings at the event, said the positive trend is the result of customers looking for and wanting to consume clean, healthful, sustainable products, like organic pasta and gluten-free alternatives. Nielsen reports that future growth is expected to come from breakthrough category innovation, tapping into millennial preferences and digital influences. “Consumers want to eat more healthfully, but they can’t do it alone. They need help from different characters from the market, including the industry as a whole. It is essential, for example, that manufacturers emphasize pasta attributes in their communication, highlighting the healthy aspects of the product,” said Mr. Tremaroli. This is good news for the pasta industry, which in recent years has had to fight back against misperceptions brought on by the rise of unhealthy fad diets. Made of two simple ingredients — durum wheat semolina and water — pasta is a complex carbohydrate that, when combined with vegetables and legumes and other healthy pairings, is delicious, and one of the easiest and most affordable of mealtime choices. Brazil is a natural candidate to host the World Pasta Day festivities with per capita consumption of 6.2 kilograms per year. In addition, Brazil is the fourth largest pasta producer after Italy, U.S. and Turkey, producing 1,2 million tonnes of pasta annually. Made from durum wheat semolina or from the flour of other grains mixed with water and/or eggs, pasta is nutritious by itself. Mixed with olive oil, tomato sauce, vegetables, beans, seafood and lean meats it is a key ingredient of healthy traditional eating plans around the world. Pasta also is good for the planet. The industry is continuing its sustainability journey that sees a progressive decrease in water consumption and CO2 equivalent emissions. Experts at the 2015 Healthy Pasta Meals Scientific Consensus meeting, organized by Oldways, confirmed that pasta is a simple plant-based food and has a low environmental impact. When prepared with local seasonal ingredients, and by sustainable methods (try a one-pot pasta to save energy and water), pasta becomes even more environmentally friendly. Pasta joins other grains, as well as fruits, vegetables, olive oil, beans, legumes, nuts, seeds, herbs and spices as the basis of the Mediterranean diet. The diet is one of the healthiest eating patterns in the world and has been linked to lowering incidences of chronic diseases like type 2 diabetes, heart disease and cancer. It also is recognized for helping people achieve weight loss and weight management goals. Because of the way pasta is made during the manufacturing process, its glycemic index is lower than less complex carbohydrate foods. This means it has a better impact on blood sugar. Additionally, pasta is digested slowly, providing steady energy and a prolonged feeling of fullness. That sense of fullness can lead to less consumption of food at the next meal. Excess calories, not carbohydrates, are responsible for obesity. Moreover, very low-carbohydrate diets may not be safe, especially in the long term. A pasta meal can be moderate in its calorie content if the portion size is correct (one-half to two-thirds cup of cooked pasta/80 grams of uncooked pasta) and the dressing or topping is not calorie rich. A study, published in Nutrition & Diabetes, links pasta intake with significantly lower body mass indexes (BMIs) and central obesity. In an age where everything is fast-paced and we’re prone to adopting nutritional fads or diets of the day, pasta remains a mealtime favorite. It is enjoyed at family tables and gourmet restaurants everywhere. Join the World Pasta Day celebration on Twitter on Oct. 25 by using hashtag: #WorldPastaDay. 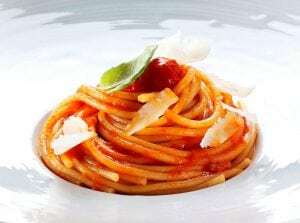 Tag your favorite #Spaghetti or #SpaghettialPomodoro dish or another pasta favorite. For more information on World Pasta Day in Sao Paulo, please visit: https://www.abimapi.com.br/worldpastaday/en/. Please contact Kyle Potvin, kpotvin@splashllc.com, 917-838-4500 for health tips, recipes, research studies, hi-res graphics or to schedule an interview. Please visit: www.pastaforall.info or Facebook (www.facebook.com/InternationalPastaOrganisation) or Twitter (@Int_Pasta_Org).